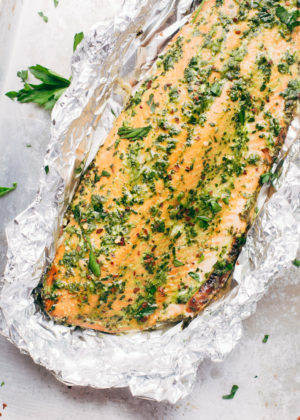 A super easy baked salmon in foil recipe that’s perfect for meal prepping! Topped with a fresh homemade chimichurri style sauce! Got your dose of BRAIN FOOD right here! This meal is completely selfless. Besides being good for us, it requires very little hands on time, and tastes like a fancy meal without tons of calories. 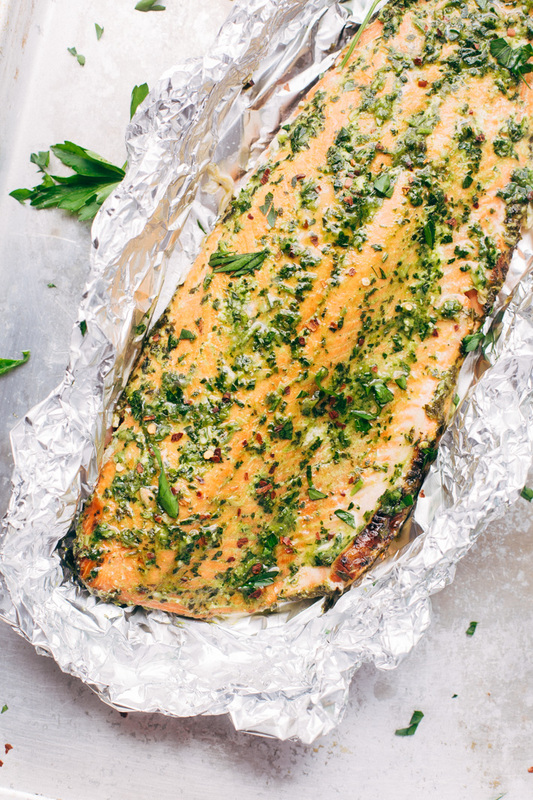 We’re talkin’ about baked salmon in foil. You are so good to us. Here it is – an olive oil and herb sauce that okay, i’ll admit it – most closely resembles a chimichurri sauce. We pulse together in a food processor while we bake salmon in foil. When the salmon is almost done, rub a tablespoon full of this stuff onto the fish and let it broil for just a couple of minutes. And there it is! Now plate it up with your favorite veggies and serve it with a little more of that tangy, herby chimichurri sauce. WOW. Is that exciting or what? Speaking of exciting, we’re just 3 short days away from our trip! (!!) I am officially knee deep in packing because woah, this whole time, I never stop to think that the difference in temperature from Seattle to Los Angeles would be in the ballpark of 35 degrees. Which I know, doesn’t seem like a whole lot. But it’s A WHOLE LOT when you factor in the number of stops we’ll be making and lugging around all of our possessions down the entire west coast for almost a week and a half. Which includes stopping at a different hotel almost every night. I laugh at myself when I think about how I was wanting to live out of a carry on for this trip. Girlfriend, that’s so not gonna happen. It’s totally killing my vibe of being a wannabe minimalist traveler. So.. problem solving here.. layering? I hear that it can go from super windy and cold to completely manageable in a matter of hours in San Francisco. Is there truth to this? Help me out friends. Is your weather just as insane as Houston? So while I pretend to keep calm and deal with this packing conundrum, i’m making easily breezy meals like baked salmon in foil to fuel my brain with tons of protein. ?? It all starts with the salmon. 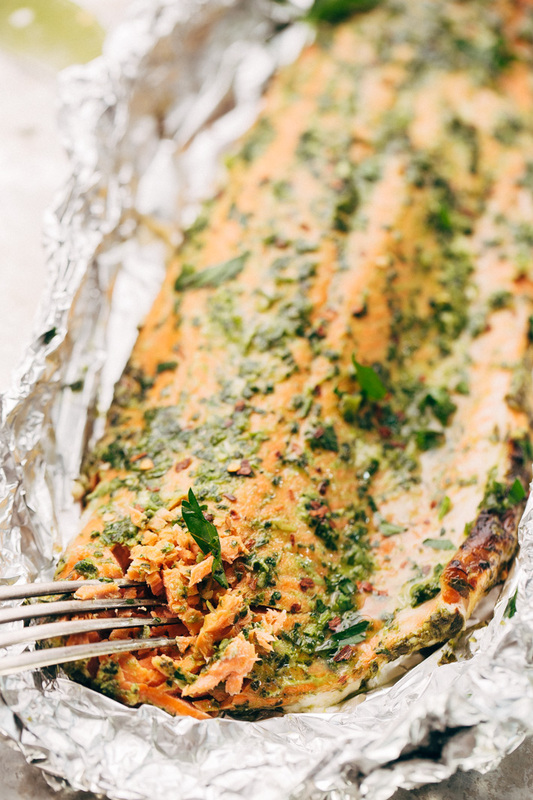 Like most of my baked salmon in foil recipes, this one takes in the ballpark of 30 minutes to make as is light on the calories. As always, i’m going to encourage you to use good quality, wild-caught salmon for this recipe. I find that using pink salmon or farmed salmon in a baked salmon recipe often leaves it kind of wet and mushy. Plus, plus, plus the flavor of sockeye or coho salmon is phenomenal. Remember friends, quality DOES matter. 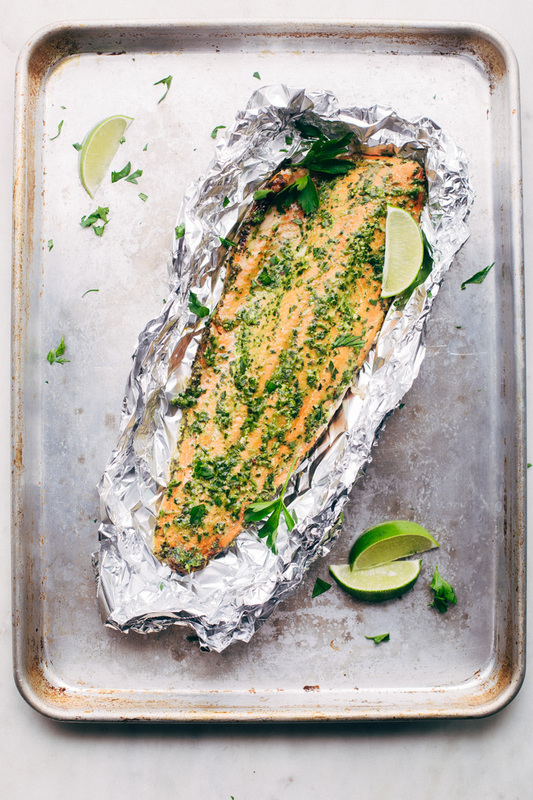 This recipe is super low maintenance like most of my recipes for baked salmon in foil. It starts by simply seasoning the salmon with a tablespoon of olive oil, a healthy pinch of salt, black pepper, and 1 clove of minced garlic. Get that going in the oven while you prepare the homemade chimichurri sauce. 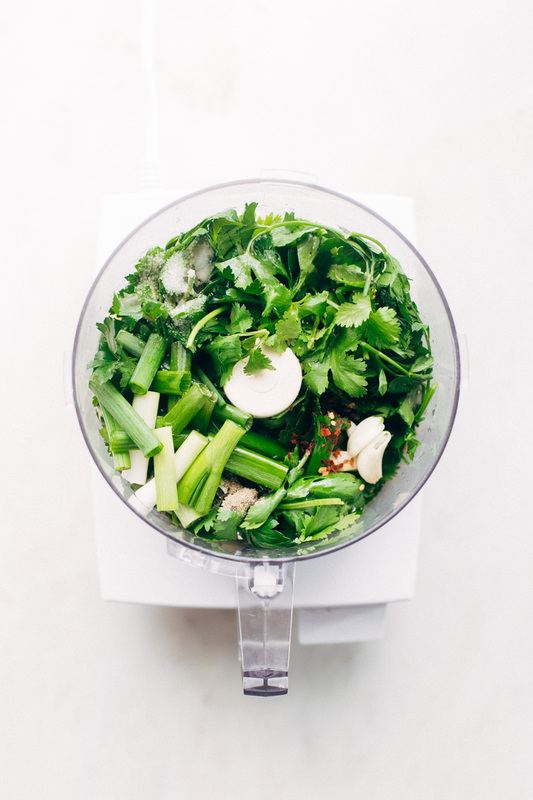 In a food processor, we’ll add a little olive oil, red wine vinegar, lime juice, salt, pepper, red pepper flakes, some parsley, garlic, a couple of scallions, and a couple tablespoons of fresh cilantro leaves. Just pulse it until it turns into a chunky sort of sauce. 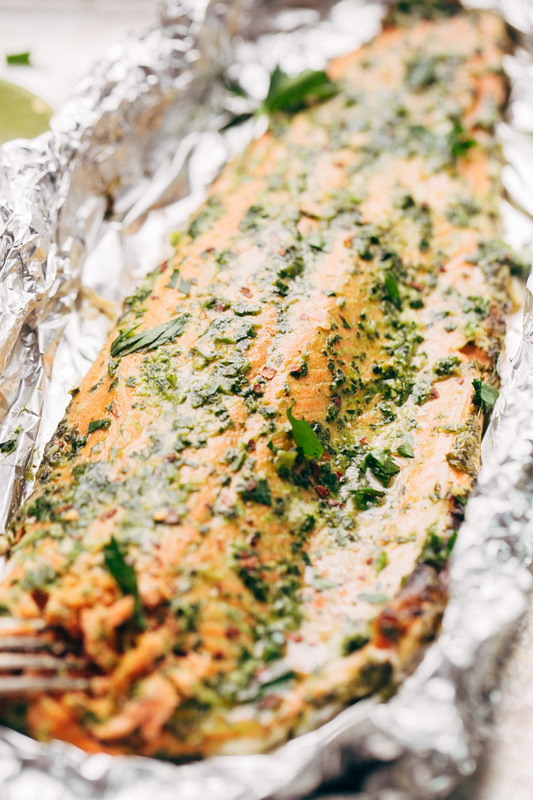 When the salmon is almost cooked through, we’ll unwrap the foil and add a spoonful of this chimichurri sauce on top. And then into the broiler it goes for just 2-3 minutes to finish is off. What you’re left with is an incredibly tender filet of fish that’s perfect to dice up and add to a salad or serve with steamed or roasted veggies on the side. 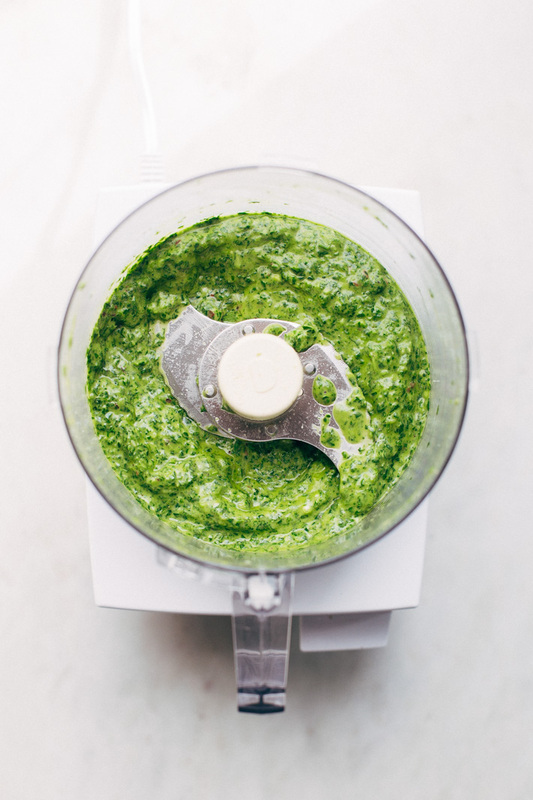 Bonus points: you don’t even need to make a salad dressing because we have the worlds most attractive green chimichurri sauce to drizzle on top of our ginormous bowls of feel-good food. Let me solve your midweek dinner dilemma with an easy 10 ingredient recipe that comes with herby sauce and fresh baked salmon straight from your oven. Remove the salmon from the refrigerator at least 15 minutes prior to cooking. Position a rack in the center of the oven and preheat the oven to 375ºF. Place the salmon filet in a piece of foil large enough to fold over and seal. Using a brush or spoon brush the salmon with 1 tablespoon of olive oil and season with a little salt and pepper and 1 minced clove of garlic. Cover with foil and seal so that all sides are properly closed. Bake the salmon for 12-14 minutes or until firm. Prepare the sauce while the salmon bakes. Depending on the thickness of the filet, it may require additional baking time. To prepare the sauce: Add ¼ cup of olive oil, 2 cloves of garlic, scallions, parsley, cilantro, red wine vinegar, lime juice, red pepper flakes, ½ teaspoon salt, and ¼ teaspoon pepper to a food processor and pulse until a thick sauce forms. When the salmon is done baking, remove from the oven, spread 1 tablespoon of sauce over the filet and broil under the broiler for 2-3 minutes, keeping an eye on it so the fish does not burn. Remove from oven and serve immediately with additional chimichurri sauce on the side. 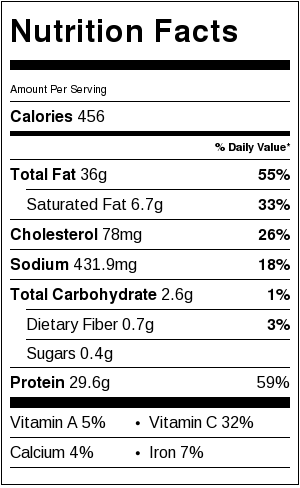 nutritional facts include ALL of the chimichurri sauce for 4 servings. If you use less sauce, your fat count/calories will be A LOT less.